James Ntim moved to Columbus from Ghana, Africa in 2000.
commercially as he opens Asanteman Kente Works. James started weaving at the age of ten(10) and weaves all of his products by himself. He is even able to customize your order by weaving letters into your scarf. In his free time, James enjoys soccer,watching TV, movies and reading. James also does public demonstrations of the art of Kente weaving. His artwork has been displayed in the Lynn and Pearl Alley Markets, the Martin Luther King Arts Complex, Ohio State University,University of Cincinnati and the Hot Times Festivals. 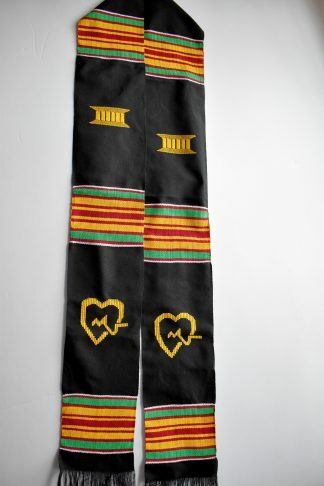 James also teaches Kente cloth crafts for kids and adults. 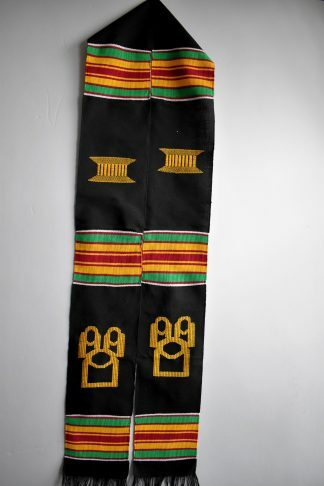 entirely or solely hand-woven on a horizontal treadle loom by the Asantes in Ghana, Africa. 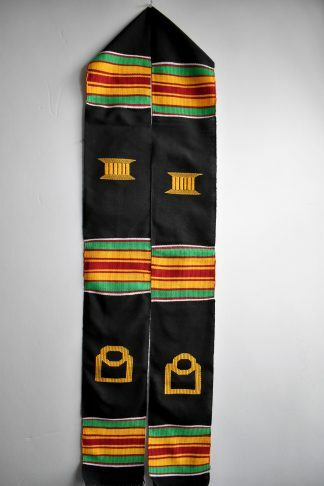 The Asante Kente is woven in the outskirts of Kumasi, in the area of Bonwire, Sakora Wonoo, Ahodwo and Ntonso. It is also woven by the Ewes in the Volta, Ghana. with respect to the weaving process. These colors and designs associated with Kente have solely made the fabric the best known of all Ghanaian and even all African textiles. Each design or cloth has a story with a proverbial meaning with its own distinction. 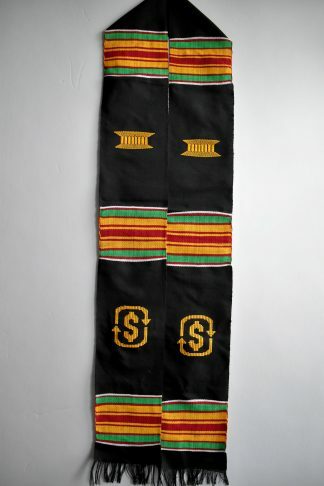 Kente is an important part of Ghanaian culture, some of the patterns are as old as civilization. 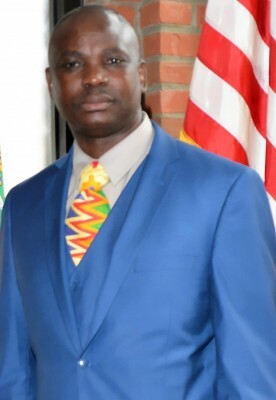 Renaming or removing Kente tradition from Ghana would be like taking Thanksgiving away from America. Kente is a connection to African culture I was told by my uncle who taught me how to weave. 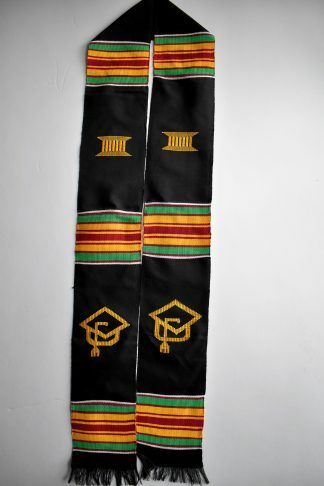 The word Kente means “basket” (kenten). Yellow – represents the yolk of the egg as well as certain fruits and vegetables. The color is a symbol for things that are holy and precious. Pink – is used to symbolize gentle qualities such as calmness, sweetness, and tenderness. Red – stands for blood and for strong political and spiritual feelings. Maroon – is associated with the color of Earth, the mother. It represents healing and protection from evil. Blue – stands for the sky and is used to symbolize holiness, peace, harmony, good fortune, and love. Green – is associated with plants and stand for growth and good health. Gold – like the metal gold, is a symbol of royalty, wealth, and spiritual purity. White – represents the white of an egg as well as the white clay that is used in certain rituals. It stands for purity and healing. Black – stands for aging because in nature things get darker as they get older. Black also stands for strong spiritual energy, and the spirits of the ancestors. Grey – represents ashes, which are used for spiritual cleansing. Silver– stands for the moon and represents serenity, purity and joy. Purple – like maroon, is associated with Earth and with healing.